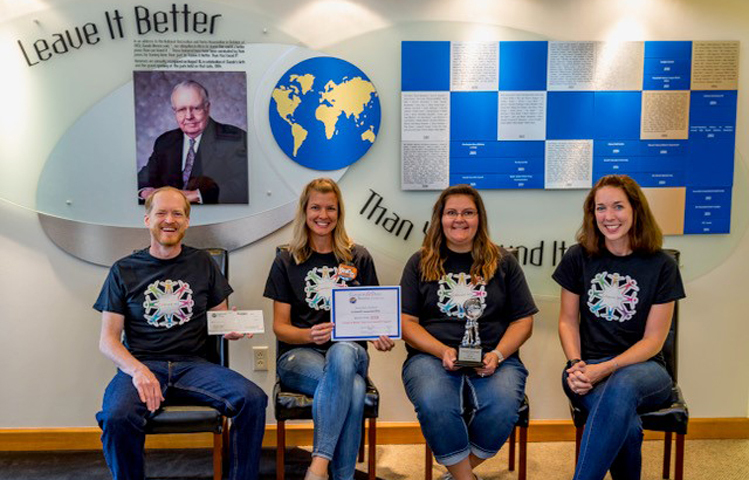 Grinnell Connected is the 2018 recipient of the “Leave It Better ThanYou Found It” award from the Claude W. and Dolly Ahrens Foundation (CDAF). Grinnell Connected is the volunteer-run, combined school booster group for elementary and middle schools formerly known as PTO. The nonprofit organization encourages engagement among families, teachers and community members and supports educational projects and initiatives beyond what the school district budget affords. The “Leave It Better” award commemorates the August birthday of the late philanthropist Claude W. Ahrens. To date, more than 300 area individuals, groups and organizations have been honored by the annual recognition program of those making a difference in the community. Grinnell Connected will receive a $5,000 grant and traveling trophy from CDAF as part of the foundation’s annual recognition. The traveling trophy will be displayed in each of the schools on a rotating basis, and the cash award will be used “to fund classroom needs that enhance the educational experience,” according to Grinnell Connected co-leader Mary Lindberg. “On behalf of Grinnell Connected, we are so very, very appreciative of this recognition from the Ahrens Foundation of the work we do for all preK-8thgrade students. There is so much more that can be done, and this generous, timely award will help extend those educational opportunities,” Lindberg said. While Grinnell Connected was organized in 2014 to combine the three separate elementary school parent/teacher organizations, Grinnell Middle School was added during the 2017-18 academic year, at the request of the principal, to assist with needs there as well. Lindberg and Connected co-leaders Nikki Laug and Mindy Kostow recently met with building administrators to encourage staff to think about what is needed to boost hands-on learning for all students. “The Leave It Better grant will help us fund those requests from teachers,” Lindberg said. One of Connected’s key activities is to fund one educational field trip for each grade level each year. The group also started the popular Mileage Club and Breakfast Book Club. Mileage Club provides students an alternative recess option in the spring for running or walking laps to earn incentives while learning to stay healthy. Breakfast Book Club provides students with a free book and breakfast, while bringing hundreds of family and community members into the schools to read with children. Free family nights throughout the year sponsored by Connected also provide students and their families’ simple ways to prioritize educational family time. Lindberg emphasized that because Connected is a nonprofit and entirely volunteer-run, the advocacy group relies heavily on community partnerships that support education and invest time, talent and funds in the schools. Specific community partnerships include volunteers from Monsanto, Lions and Rotary Clubs, as well as the Partners in Education with Grinnell Mutual, Unity Point-GRMC, and Hy-Vee. “Another of Connected’s key activities is the Reading is Fundamental (RIF) program. We have been very fortunate to partner with the Grinnell College Center for the Humanities the past two years to fully fund the RIF program, which allows every elementary student to receive three reading level appropriate books each year to support literacy outside of the classroom,” Lindberg said. The group continuously seeks additional grants and monetary support to maintain and expand each year’s projects. In addition to annual fundraising efforts, Connected has received recent grants from Lincoln Savings Bank and the Grinnell College Mini Grants program. Connected’s first meeting of the 2018-19 school year will be Tues., Sept. 4 at 7 p.m. at Davis Elementary School. Meetings are open to anyone interested in learning more about Connected activities or in volunteering. Community members interested in volunteering can also send email to grinnellconnected@gmail.comor indicate interest on the Grinnell Connected Facebook page. Gifts to Grinnell Connected may be made in care of the Grinnell-Newburg School District. Information about the Leave It Better Award is available at http://ahrensfamilyfoundation.org/leave-it-better-awards/.